Went through about thirty boxes of slides looking for the best representations. The slide of us in our school dresses may have been given to us by your father, as the slide cover was totally different, white and black, while all the other slides were red and white. For some reason, the slide had turned red and required fiddling with the color correction. It was a joy to view the pictures again. I remember so many of those outfits. I hated the dresses that were scratchy. It was very important to mom that we looked our best. We had several heated battles in my teenage years. One centered around a leopard head band on a purple felt hat. Well, maybe I should do a part 2, teenage fashions of the 50s-60s; lots of tensions with parents around long hair and mini-skirts. So darling, all of those old pics! Dad took lots of slides back then. We used to set up a projector and have slide shows. Thanks for stopping by. Selection of clothing has been a problem for some time, when you take into consideration the impact of Mass Media from the end of the 19th century through the 20th and to the present. Mass media both reflects & shapes values, beliefs & ideologies. From the original Floradora & It Girls to Katy Perry , one can see how fashion & body image were shaped by popular Mass Media icons. Add to this the business interests that have turned Dale Evans cow girl outfits to Disney princesses and wearing logos & brand names as a fashion statement & “expressions of individuality & being part of the group”. Parenting is now even more of a minefield. b) why blame the teens for wearing clothing designed, marketed & sold in stores. All of it was run by the adults. Thanks for the link. Good point about the retailers . . . rarely do capitalists get the blame or the heat. Very interesting post. 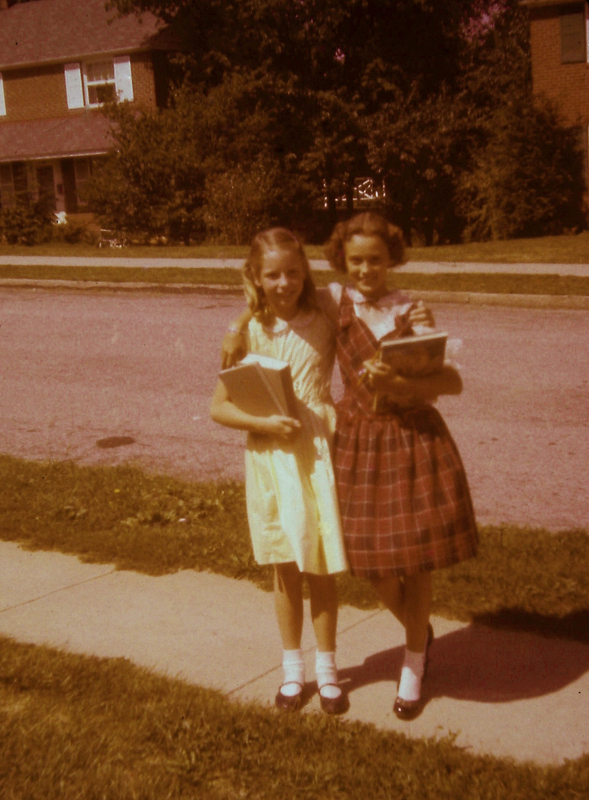 In Canada girls had to wear dresses to school as well, even when mini skirts were in style and the temperature was -16°F. I went on my first protest march then, for the right for girls to wear pants to school (1968). We won, but it had to be dress pants. I always thought it was better in the States as in Leave it to Beaver the boys wore jeans. For us women, that was another protest march in 1975, for the right to wear jeans to work when the men were allowed but not the women, and we had messy jobs. From an early age, I remember questioning why girls had to wear dresses as that policy never made sense to me. My second year of teaching, they changed the policy that women could wear pant suits . . . gradually that morphed into just pants. I guess authorities just couldn’t be bothered policing that dress code. Thanks for sharing your experiences and protest efforts! Very interesting – thanks for sharing. I had Enid Blytons images running through my head as I read. Samuel Pepys would be proud. People do not think to record the mundane and yet that is precisely what many historians seek. Ah, Samuel Pepys, wasn’t he the man Gilbert and Sullivan parodied in HMS Pinafore? . . .”stick close to your desk and never go to sea, and you all may be rulers of the Queen’s navy.” Well, thanks for the compliment! Thank you for the trip back to the days of outfits with aprons, penwipers, twin prints, rick-rack, sashes, pinafores, jumper effects, piping, and appliques; petticoats; and starching and ironing burdens for mothers. And the modern, postwar, easy-care solution: nylon. I have a photo of a birthday party from the mid-1950s, in which almost every girl has a nylon dress, and one boy is sporting a nylon sports shirt. Could not skimp on the underlayers when wearing nylon!